Can a Jedi / Sith stop being one and live on without the Force? And by that I mean do Jedi/Sith have the power to expel the midichlorians from their own body's and thus stop being a Jedi, or a Sith forever? And by that I do not mean stop showing any alliance to either party. Someone who stops being a Sith could still want to join them, only aiding them otherwise. In Legends continuity, there are several cases of cutting oneself off from the Force, but in all of them, it was later restored. The protagonist of Knights of the Old Republic II: The Sith Lords instinctually cut herself off from the Force to survive the devastation that occurred on Malachor V which turned the place into a Wound in the Force. Kavar: It was too much for any Jedi to endure... and it is a wonder that you did not die there when thousands perished, all those you and fought with and struggled with. You cut yourself off, because you had to if you were to survive. She later recovered her connection to the Force over time, and retraining her Jedi skills. After defending the VALLEY OF THE JEDI from the evil JEREC and nearly falling to the Dark Side himself, former Jedi Knight KYLE KATARN has severed his connection with the Force and returned to his mercenary ways. The mechanics of how he severed his connection with the Force aren't elaborated on, but he reconnects with the Force when he goes to the Valley of the Jedi, a powerful nexus of the Force. So either it was involved in severing his connection, or he did something else to deaden his connection. Either way, midichlorians weren't involved. 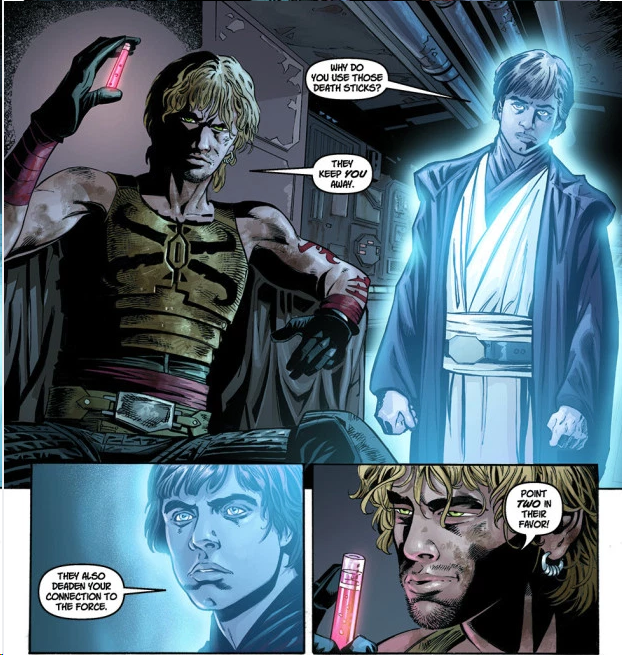 While not completely cut off from the Force, Cade Skywalker, descendant of Luke Skywalker, used death sticks to temporarily cut off his connection with the Force. Luke Skywalker (Force Ghost): Why do you use those death sticks? Cade Skywalker: They keep you away. Luke: They also deaden your connection to the Force. Cade: Point two in their favor! He later recovered by stopping the use of Death Sticks and embracing his Jedi identity. The Exile from Knights of the Old Republic 2 was cut off from the Force for her actions during the Mandalorian war. The connection was eventually restored, though. Technically it's not canon anymore, but there are rumors of films set during the Old Republic coming out. Expel midichlorians? No. Midichlorians are mitochondria with a thick layer of pseudoscience. You can pull a Luke Skywalker and devote your Force abilities entirely to blocking out his own interaction with the Force, meaning that the only thing he's doing with it making himself invisible to and untouchable by other people's Force abilities. Or conceivably you could experience some kind of brain damage or psychological trauma that keeps you from accessing the Force in any obvious kind of way. But ultimately everything in the Star Wars galaxy needs their connection to the Force just to live, just like having mitochondria isn't an optional thing for any kind of animal life in real life. Have Midichlorians Ever Communicated Directly With People? Could several Jedi peacefully overpower one Sith opponent through nonviolent Force techniques? Force Magic: Why No Light Side Equivalent? Jedi/Sith using force in combat with other Jedi/Sith? Is the term “Dark Jedi” oxymoronic? How does taking-a-Force-sensitive-youngling-to-the-Jedi-Temple go down? Does saying “May the force be with you” actually 'do' anything? Could the Republic survive without Sith?